Lose weight, lower cholesterol, significantly reduce the risk of disease, and become physically fit—in just 4 weeks. Professional athlete-turned-firefighter Rip Esselstyn is used to responding to emergencies. 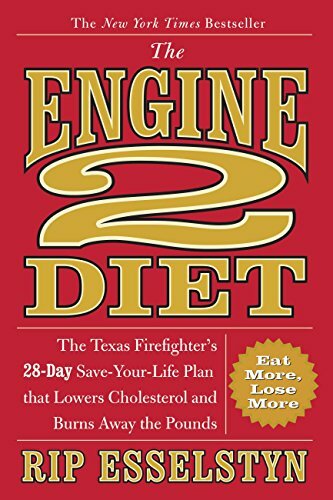 So, when he learned that some of his fellow Engine 2 firefighters in Austin, TX, were in dire physical condition (several had dangerously high cholesterol levels - the highest being 344! - he sprang into action. He created a life-saving plan for the firehouse. By following Rip's program, everyone lost weight (some more than 20 lbs. ), lowered their cholesterol (Mr. 344's dropped to 196), and improved their overall health. Now, Rip outlines his proven plan in this book. With Rip as your expert coach and motivator, you'll transform your body and lifestyle in a month. His plant-powered eating plan is based on a diet of whole foods, including whole grains, fresh fruits, vegetables, legumes, nuts, and seeds. Rip's simple, firefighter-inspired exercise program that will boost your metabolism and melt your fat away. Medically approved, easy-to-follow, and amazingly effective, this diet is designed for anyone who wants to make heroic strides in his or her health, weight, and well-being, all without heroic effort. Product Description: Lose weight, lower cholesterol, significantly reduce the risk of disease, and become physically fit--in just 4 weeks.